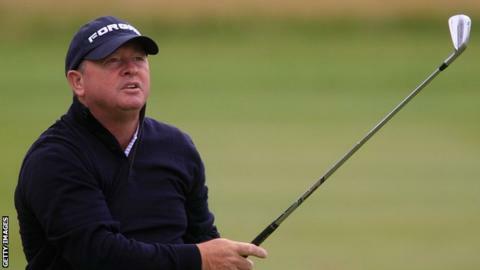 Former Ryder Cup captain Ian Woosnam says debutant Jamie Donaldson will thrive under the pressure when Europe face the USA at Gleneagles. Welshman Donaldson, 38, secured his place in Paul McGinley's Ryder Cup team by winning the Czech Masters in Prague in August. Compatriot Woosnam played in eight Ryder Cups and he says Donaldson has what it takes. "He's got the game and the bottle to go with everything," said Woosnam. "His game has improved over the last three years immensely. "He's in the team now, all the hard work has been done. It's a lifetime dream for any player in the Ryder Cup. "We tell all our first-timers to enjoy the experience, take it all in and to do the best you possibly can." Donaldson will become the seventh Welshman to play in the event after Woosnam, Dai Rees, Bert Hodson, Dave Thomas, Brian Huggett, and Phillip Price. Europe are targeting a third-successive Ryder Cup victory after winning at the Celtic Manor in 2010 and in Chicago in 2012. Woosnam, who captained Europe to victory in 2006, says there is no doubt that the home team should beat the USA once again. "They're going to be a stronger team," said the 56-year-old. "They're most probably going to be the favourites. "But the Americans are underdogs and they could perform better.